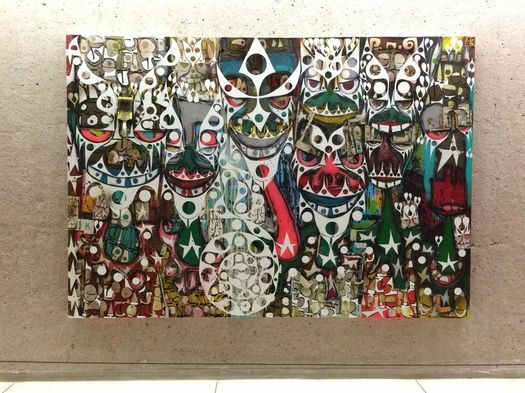 A portion of "New Morning I" by Alvin D. Loving Jr, which is on display in the concourse. Jackson Pollock - Mark Rothko - Robert Motherwell - Helen Frankenthaler! 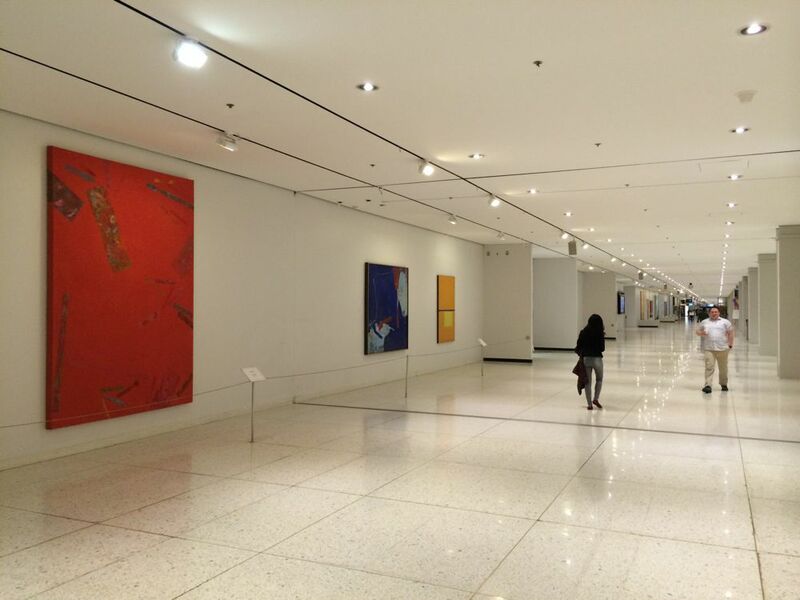 Explore artwork by some of the most famous contemporary artists in the world! The Empire State Plaza Art Collection is one of the most impressive public collections of contemporary art in the country. Join us on a 30-minute lunchtime tour of selected works and learn about the New York School, Abstract Expressionism and other facts about this amazing collection. Each tour will focus on a different selection of artworks and on various themes including, sculpture in nature, women artists in the collection, art you can touch, creating the collection, artists who are World War II veterans, and art as propaganda in the Cold War. Weather permitting, tours will take place inside and out. 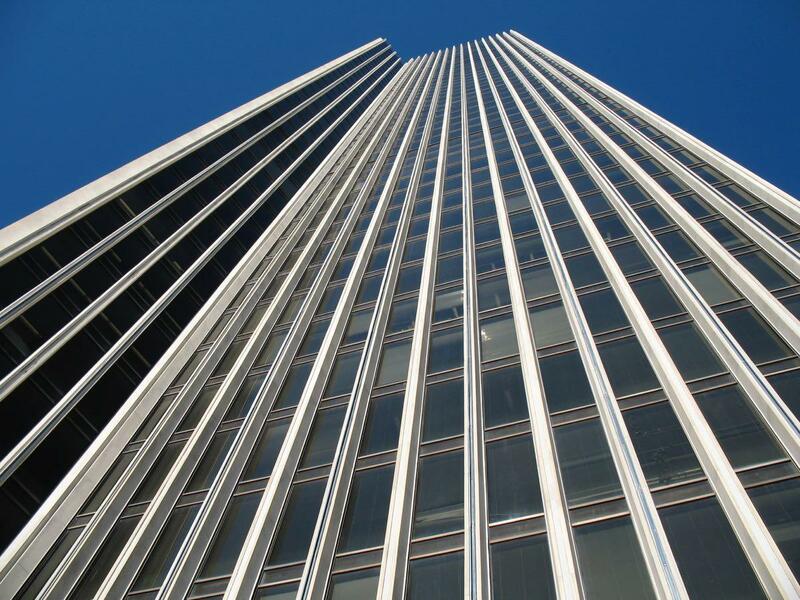 The crews will be moving equipment for a new maintenance rig for the Corning Tower. Joseph Brill, a spokesman for the state Office of General of Services, said the process is planned to include a series of nine lifts, starting at approximately 9 am, which will include more than 11 tons of equipment. The schedule is dependent on the weather. Because you might notice: The state Office of General Services recently announced that it's temporarily removing the Alexander Calder sculpture Triangles and Arches from its place in the reflecting pool in front of the State Museum. "Our responsibilities as stewards of the Empire State Plaza Art Collection include an ongoing commitment to provide generational treatment to works of art that require conservation," Commissioner Destito said. "OGS is having the Calder sculpture, Triangles and Arches, deinstalled in preparation for conservation. Our goal with this sculpture and the other artworks we have conserved in recent years is to ensure that future generations will be able to view and enjoy this unique collection that belongs to the people of New York." Weighing approximately 8,000 pounds, Triangles and Arches consists of seven steel base plates projecting from seven piers rising out of the reflecting pool. Over time, the paint on the sculpture has deteriorated, and disassembly of the sculpture is needed to determine what conservation is required. That photo above is from early May. If you look closely, you can see there's paint peeling and missing from the sculpture. 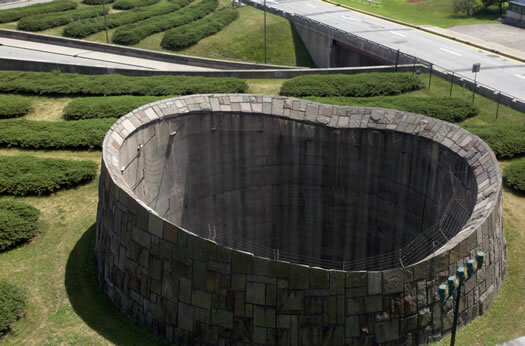 Last fall OGS re-installed the nearby François Stahly Labyrinth on the Empire State Plaza after it was removed for a multi-year restoration project. 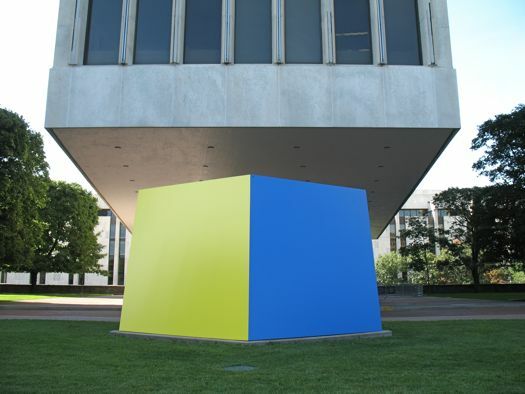 And a decade ago the state temporarily removed the Ellsworth Kelly piece Yellow Blue so that the steel could be refurbished and the paint reapplied. OGS is looking for proposals for murals that will reflect the character of the State of New York and that will be made distinctive through the choice of design, color, and subject matter. 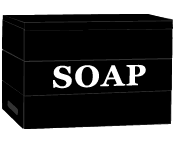 The design should be suitable and acceptable for public viewing by people of all ages. The content of the murals should not serve as any sort of promotion or branding for any business or organization, or be overtly political in nature. As this is a government contract job, there's a formal request for quotes process that details requirements and how bids should be submitted. There's also a mandatory site visit April 4 at 3 pm at which bidding artists will be able to ask questions. OGS says the all-in price for the art work is not to exceed $21,000. This could be a really cool opportunity -- not just because the work could brighten the day of thousands of people, but also because your work will be on display in the same venue as that of the ESP's extensive art collection. An upside of the lingering winter: The season at the Empire State Plaza ice skating rink has been extended another week. So the last day of the season is now Sunday, March 18. And there will also be another day of free skate rental this Friday, courtesy of Hannaford. It's free to skate. And skate rentals are $4 / $3 for kids. A photo ID is required for skate rental. By the way: Our favorite time to go skating at the rink is midweek in the evening. 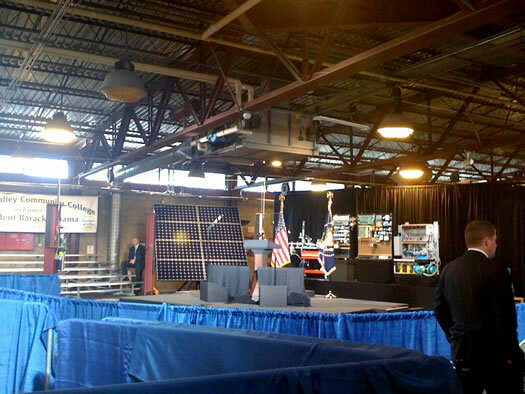 There are often smaller crowds. And it's a fun thing to do to break up the work week. 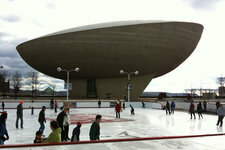 The ice skating rink on the Empire State Plaza opened for the season Friday. The rink is open seven days a week, 11 am-8 pm (closed 3-4 pm for maintenance) -- weather permitting. It's free to skate. And skate rentals are $4 / $3 for kids / free on Fridays. A photo ID is required for skate rental. The rink often gets busy on weekends. Our favorite time to go is in the evenings during the week. As we've said before, stopping by to skate for an hour after work + dinner someplace downtown = a better than usual Wednesday. Friday also was opening day for skating rink in Albany's Swinburne Park (map). Winter is happening: The ice skating rink at the Empire State Plaza is set to open December 1 (weather permitting), the state Office of General Services announced today. There are also a series of free learn-to-skate and hockey clinics -- that link includes the schedule. Keep an eye out for when registration opens because they fill up fast. The annual ESP tree lighting is December 3 this year. There's a whole day of events leading up to the lighting at 5:15 pm and fireworks at 5:30. Also: There's rock-and-skate event with Moriah Formica that evening from 6-8 pm. AOA is a sponsor of the ESP skating rink. 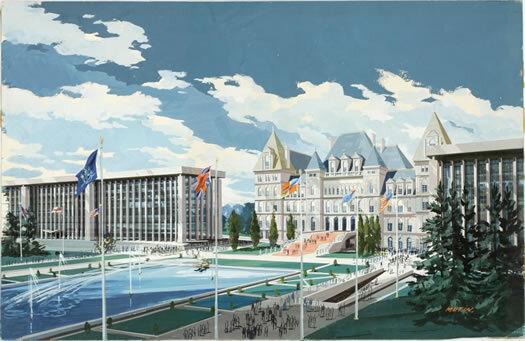 What would Albany be like today if the Empire State Plaza had not been built? Albany has a long history -- more than three centuries as an incorporated place -- so there have been plenty of "what if" points along the way. 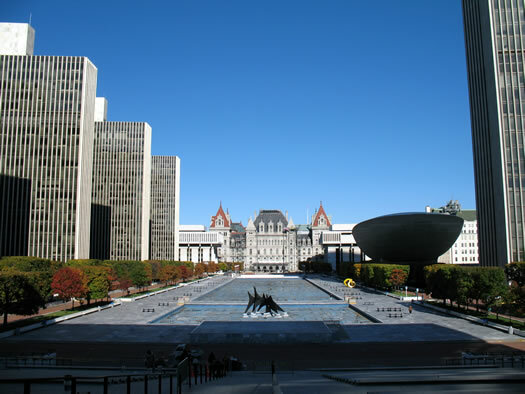 But the biggest one, literally and figuratively, might be this: What would Albany be like today if the Empire State Plaza had not been built? If you'd like a larger version. We've had run of rainbow weather lately -- pop-up showers, with sun streaming in from one side and dark clouds as a backdrop on the other. And the (double!) rainbow Sam captured arcing over the ESP this past weekend is maybe the best we've seen of the recent batch. 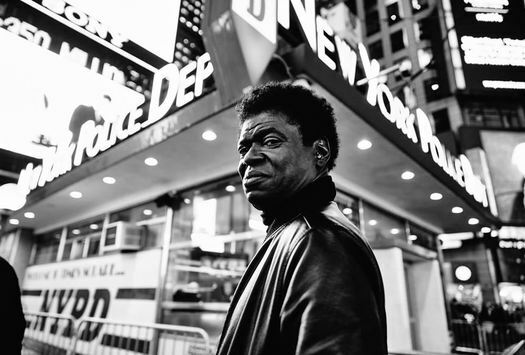 Charles Bradley & His Extraordinaires will be there in July for a concert. The schedule for this summer's lineup of events at/near the Empire State Plaza is out. 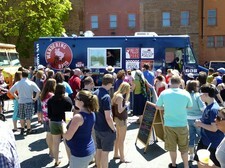 It includes a mix of concerts, festivals, and outdoor movie screenings. The series stars June 28. The events are all free to attend. The Empire State Plaza is set to become "a self-sustaining, power-generating island unto itself" as part of a plan formally announced by the Cuomo admin Monday to build a power plant and microgrid for the ESP buildings. In other words, the ESP is basically getting its own power plant and if there's a power outage, it'll still be able to have power. 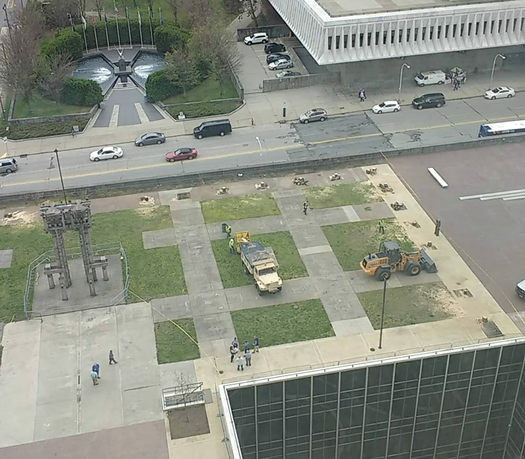 James tagged us on Twitter today after noticing that a crew had taken down the trees in the southeast corner of the Empire State Plaza. (That's his pic above.) It's the corner where the labyrinth usually stands. He was wondering what was up because the scene was now looking... sparse. The trees -- maples -- had contracted a disease called verticillium wilt, according to Heather Groll, the communications director for the state's Office of General Services. She said via email they're being replaced with "some lovely red oaks" and the new trees will be in place later this spring. As mentioned, that corner is where the wooden labyrinth by Francois Stahly usually stands. The structure had been in bad shape in recent years and OGS decided that on-site repairs weren't enough. So pieces of the art/playground were shipped off to Vermont in the fall of 2015 for restoration -- here's a Paul Grondahl article about the process. Groll said Thursday she didn't have a timeline for its return. The restaurant space on the ESP near the foot of the Corning Tower is back operating as a restaurant again -- Cornerstone at The Plaza opened this week. It's serving lunch Monday through Friday from 11 am-3 pm while in the state legislature is in session. There's also a happy hour Wednesday from 3-7 pm. The menu will include foods and beverages produced in New York State, including a locally-sourced selection of artisanal cheeses; a warm winter kale salad featuring chorizo from Dashing Star Farm; a vegetable torta made with local farm eggs; and beef short ribs braised in Nine Pin Cider. We stopped in for lunch Thursday. It was nice. The space -- about half of which was set up for lunch service -- has great windows which look out onto the plaza. The atmosphere was relaxed, and the service friendly. The music could use an upgrade. (If you're ever wondering if a chamber orchestra version of "Hotel California" is a good idea, the answer is always no.) There's an elevator inside that connects to the concourse below. Here are a few pics if you're curious. 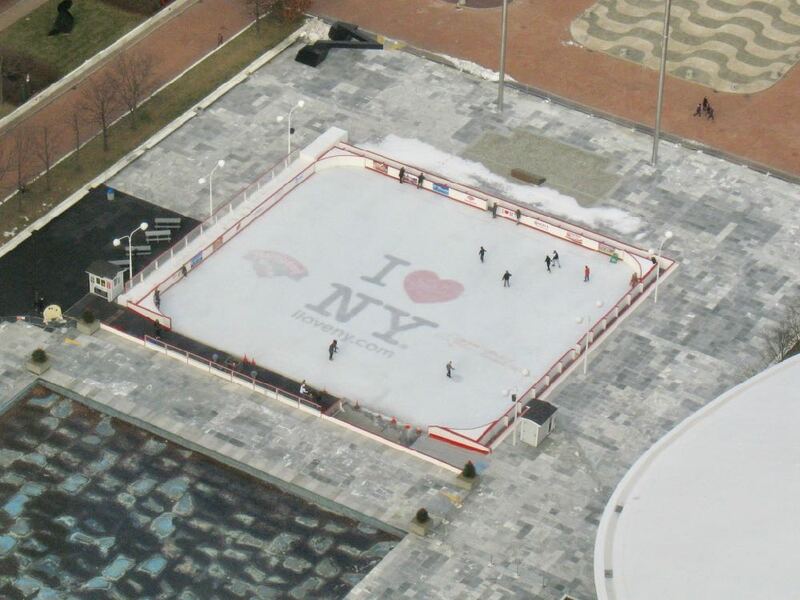 The ice skating rink at the Empire State Plaza opened for the season Friday. When we stopped by this afternoon there were a bunch of kids skating and laughing. The rink will now be open seven days a week, 11 am-8 pm (closed 3-4 pm for maintenance). It's free to skate. And skate rentals are $4 / $3 for kids / free on Fridays. A photo ID is required for skate rental. And, of course, the rink is open weather permitting. The rink does tend to get busy on the weekends. Our favorite time to go is in the evenings during the week. (If you're driving, you can usually snag a spot along State Street.) Stopping by to skate for an hour after work + dinner someplace downtown = a better than usual Wednesday. And it's good to see people out in the space during the winter. It makes it seem less cold. 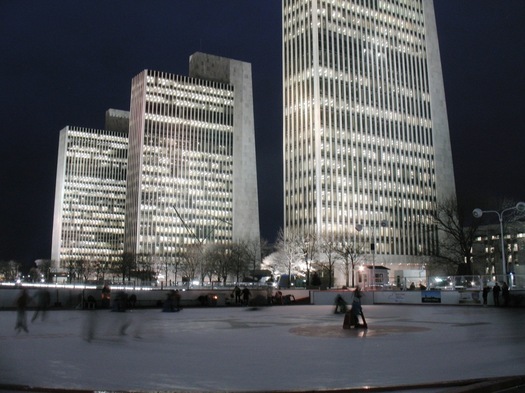 The ice skating rink at the Empire State Plaza is set to open for the new season December 2 (weather permitting), the state Office of General Services announced Thursday. Also again this season, there's a series of free learn-to-skate clinics. The first is December 3. These clinics require pre-registration and often fill up fast. We try to make it over to the ESP to skate a few times each winter. The rink can get crowded on the weekends. But we've found the weekday evenings are often not crowded. And if you pair an evening skate with dinner downtown somewhere, that's a pretty good Wednesday (or Tuesday or whatever day). Also: It's a beautiful scene taking turns around the rink with the buildings lit up. OGS has also announced the lineup of winter events at the ESP, including the tree lighting, which is December 4 this year. AOA is a media sponsor of the ESP ice skating rink. An untitled work by Frost that's on display. Here's a larger pic if you'd like a better view. 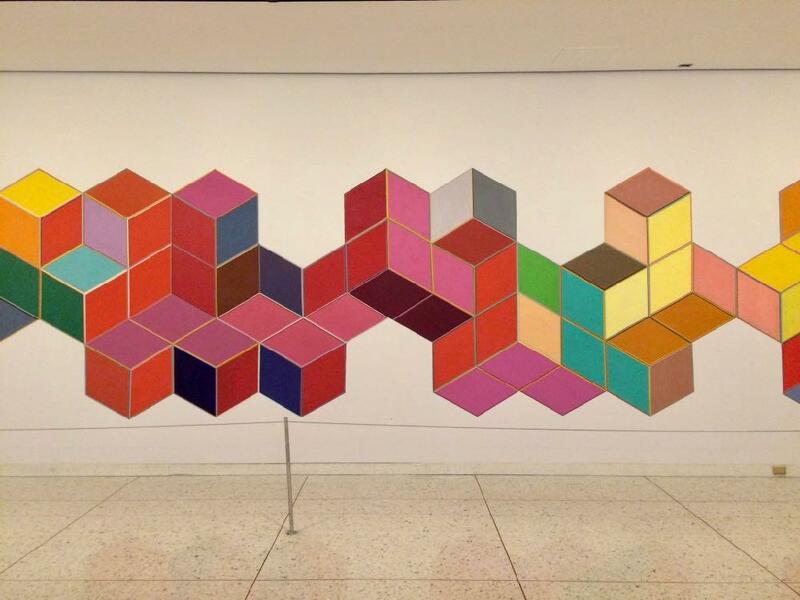 We had a few minutes this week to check out the new Phil Frost exhibit on the ESP concourse, Magnetic Shift. It's in the Corning Tower, just behind the escalators that lead up to the plaza level. Frost creates work that combines the raw, gritty edge of the street through the use of found materials with an elegant, painterly aesthetic. Frost describes his art as being "comprised of a depth of layered sinuous sheaths of glyphic information that I refer to as intuitive mathematics; they are overlaid and dance atop figurative busts and repetitions or grids of heads that I call perceptive portraiture." Frost first became known in the early 1990's for his involved installations on the streets of New York City. The exhibit is open Monday-Friday from 6 am to 6 pm. It will be on display through August 18, 2017. Coming to the Empire State Plaza main cafeteria in September: Bombers, Kuma Ani, and The Dutch Pot. Bombers Burrito Bar Hours: Monday - Friday 10:30 a.m. - 2:30 p.m. Locally owned since 1997, Bombers will serve its signature burritos, bowls, tacos and salads.Â Â Favorites including ancho chili chicken, southern fried catfish, "Red Stripe" jerk pork, quinoa bowls, buffalo chicken salad and more. Kuma Ani ExpressÂ Â Hours: Monday - Friday 10:30 a.m. - 2:30 p.m. Kuma Ani burst on to the Albany sushi scene in 2015 and has earned a stellar reputation infusing authentic Japanese dishes with Western culinary techniques. Tuna, salmon, yellowtail, seaweed coâ€mingle with, Spanish mackerel, king salmon, madai, rice paper, lobster, soy paper and more for sushi, salads, Shumai, miso soup and more. Kuma Ani is at 287 New Scotland Avenue in Albany's Helderberg neighborhood. The Dutch Pot is at 418 Madison Ave, just east of Delaware/Lark, in Albany. And Bombers, well, you know where the Bombers locations are. Friday afternoon zone out: Drone video of the Empire State Plaza by YouTube user Timothy Jackson. Some of those passes low along the reflecting pool are beautiful. This is just the middle portion of "Untitled." Here's a view of the the whole work. A lot of the art on display in the concourse of the ESP can be an acquired taste. 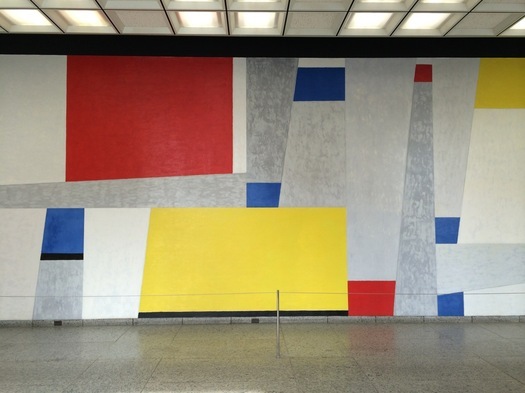 But we liked this 1968 mural by Fritz Glarner from first glimpsing it. The work covers a wall in the Abrams Building opposite a series of windows the look out into the Vietnam Memorial courtyard. Maybe it feels more alive because it gets natural light. Glarner was an immigrant from Switzerland. His style was influenced by the work of Mondrian, who was a friend. (See it now?) 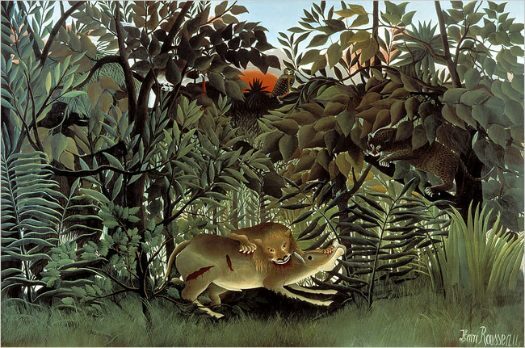 About five years before creating the mural above he was commissioned by Nelson Rockfeller to design the dining room of Rockefeller's NYC apartment -- the panels he created for that project were later sold during the 1980s, and are now part of a museum collection in Zurich. The mural in the Abrams Building was commissioned for the ESP. And according to placard for it, the work was created in three sections and then attached to the wall, "specifically placed to complement its surroundings." It ended up being Glarner's last mural. He died in 1972 at age 73. The Cuomo admin announced this week that $22.4 million will be spent rehabbing the South Mall Expressway, which connects I-787 to the Empire State Plaza. Work is scheduled to start later this month. The project is scheduled to happen in stages -- the westbound side (toward the ESP) this year, the eastbound side (toward 787) next year, and then work under the bridge in 2018. Also: "Consistent with Governor Cuomo's Driver's First initiative, the project has been designed to minimize impacts to expressway traffic. Work that will most affect travel lanes has been scheduled for summer months, when traffic volumes are lower." The future of 787 is always a hot topic because a lot of people see the highway's placement and shape as a barrier -- between Albany and the riverfront, between downtown Albany and the South End. And if you compare aerial photos of Albany pre-South Mall Expressway and after, you can see the huge path the road plowed through downtown. "Echoes" is the companion film to "The Neighborhood That Disappeared," an examination and celebration of Albany, New York's multi-ethnic South End enclave, which was demolished for the construction of the Empire State Plaza in the early 1960s. "Echoes" continues the story of the South End's vibrant Italian immigrant community by exploring the lives and culture of their children and grandchildren, many of whom were displaced by the demolition of 98 residential acres in the heart of the capital city. These engaging residents reminisce, sometimes sadly, often humorously, on the joys and cohesion of their close-knit upbringing, as well as the challenges of assimilation. The doc will re-air at multiple times over the next week (check the first link above). The Neighborhood That Disappeared will also air Tuesday night, at 9 pm. 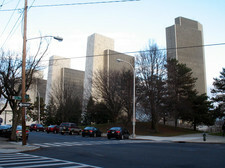 Earlier on AOA: Who lived in the neighborhood knocked down for the Empire State Plaza? This documentary is filmed in ultra-high definition. Footage is edited with additional historic and scientific interviews, recreational footage, and archival images from both the Albany Institute of History and Art and the Library of Congress, to create a breathtaking and informative program for viewers. The documentary explores the wonder of Thacher Park from never before seen perspectives and ask challenging questions about land use, conservation and historic preservation. It's set to air Wednesday, December 2 at 7:30 pm. 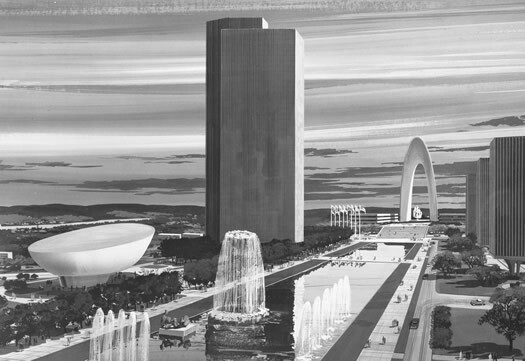 We were picking through the Albany Institute's online collection the other day and came across a handful of Empire State Plaza design renderings that we don't think we had seen before. And maybe you haven't, either. So, because it's interesting to wonder what if, let's have a look. The ice skating rink on the Empire State Plaza is scheduled to open December 4, the state Office of General Services announced today. (That is weather permitting, of course.) The rink is on the Capitol end of the plaza, near The Egg. It looks like the details for this season are the same as in years past. The rink will be open seven days a week from 11 am-8 pm. It's free to skate. Rentals for skates are $4 for adults / $3 for kids. And skate rentals are free on Fridays. The rink will also have free learn-to-skate clinics during the season (with free skate rental). The first is the morning of December 5. These clinics tend to fill up very fast, so keep an eye out for the registration (it's already open for the December 5 clinic). It's fun to skate on the plaza. It can get a bit crowded on weekends -- we've found the best time is often to stop by after work on weekday. A little early evening skating + dinner downtown is a nice night out. OGS announced a whole slate of winter events at the ESP today. And of course that includes the annual holiday tree lighting event, which is December 6 this year. 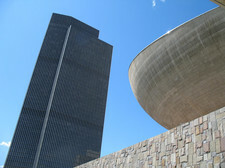 The Empire State Plaza at 50 exhibit at the State Museum includes a handful of videos about the plaza's creation and inner workings. And it looks like many of those videos are posted online. Here's one we thought this one was interesting -- it's about the massive chilling system for the plaza, which relies on water pumped from the Hudson River and power from the steam generation plant over in Sheridan Hollow. The system cools 10 million square feet of space at the ESP. The plant could theoretically cool about 9,000 homes, according to the video. By the way: The water in the reflecting pools at the ESP is also from the Hudson River. Sarah Stapleton, a nurse and Irish immigrant, once lived and worked with her doctor husband and sons in this elegant State Street home. Here's more of her story. First, Rockefeller declared that that the area "was one of the worst slums in the United States," asserting that it suffered from a distressingly high rate of infant mortality. Second, he estimated the area's population to be 9,000 persons. In fact, these 40 blocks were home to a diverse population of 7,000 persons. And it was not one big "slum." 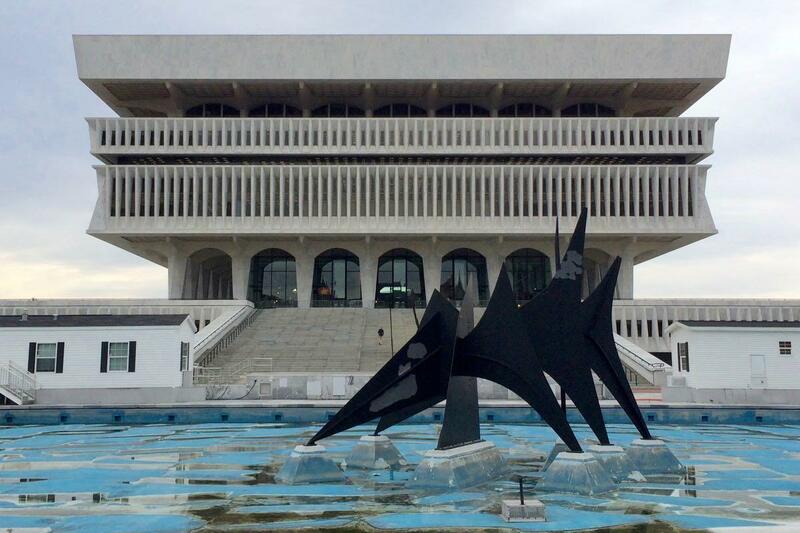 We stopped by the State Museum this week to see the new exhibit marking the 50th anniversary of Empire State Plaza. The exhibit includes photos, renderings, and art related to the plaza's construction. And it's not a large exhibit, so it only takes about 10 minutes to go through. If you're like us, you might leave wanting a bit more. But there are events in September that maybe will fill in some of the gaps. Anyway, out in the lobby of the museum is the large model that was used by the Rockefeller administration to illustrate the plan. (Albany Archives added some context and discussion this week.) We probably could have stood there for a half hour easy looking at all the little details. I know that others find it too brutal or forbidding, but I think it's beautiful in its monumentality and starkness. Monumentality always suggests supreme power, and that's scary. I somehow think that if you could populate the Plaza with more gardens, and make it feel more part of everyday life -- which they've tried to do with farmers' markets and using the basin for ice skating -- then it wouldn't feel so hostile. Two decades ago apparently there was an idea floating about to to convert one of the ESP's reflecting pools into a large lawn -- we posted it about it on AOA last year, and it got a mixed reaction from people. We were thinking about that again during a recent evening walk on the ESP. The reflecting pools do have a grandeur about them, but maybe they're also part of what makes the space feel cold to people. * It's a NYT magazine, but not the NYT Mag. 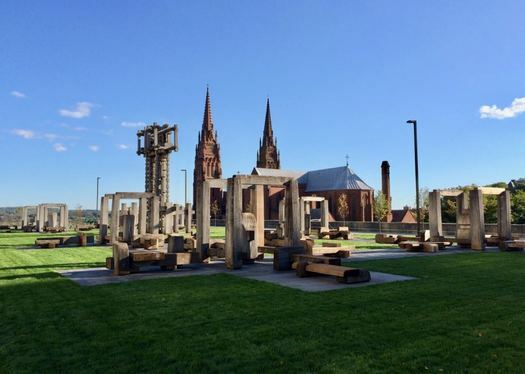 This summer will be the 50th anniversary of the official corner stone being placed for the Empire State Plaza, and there's a series of events an exhibitions lined up to commemorate the anniversary. 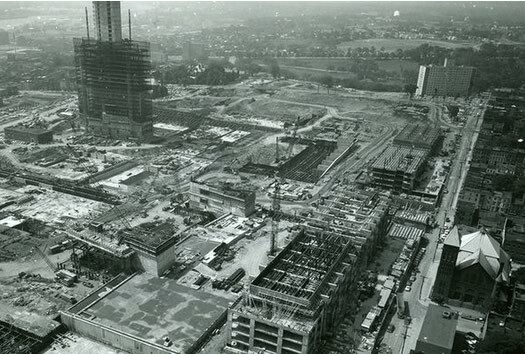 Scheduled to open on June 21, 2015 and run through January 17, 2016, this special exhibit will tell the story of the Plaza's construction and evolution. Located in the main lobby and west corridor of the museum, it will include art, photographs, digital displays, original sketches by architects, and examples of the architectural elements that make up the Plaza and where they came from. Visitors to the exhibit will discover how such a massive complex is heated in the winter and cooled in the summer, what the "Rule of 30" is and how it was incorporated into the design of the Plaza, and hear the stories of those who worked on the project. The ESP is a remarkable, interesting, and unavoidable subject in this area's history. We hope the exhibit, and related events, examine and highlight not just its grandeur, but also its complications and tradeoffs. Once there was a plan to build a sprawling state-subsidized, mixed-income community, known as Roosevelt Terrace, alongside the South Mall Arterial and within the 98 acres seized by the State. * All that remains of that plan is a stripped-down version of the senior apartment complex, South Mall Towers on South Pearl Street. Landscape played a key role in the design of Roosevelt Terrace. Situated on ten acres and surrounded by grass and trees, the eight reddish-brown brick apartment buildings were to be connected by a series of outdoor sitting areas and playgrounds, designed to promote sociability or to facilitate quiet contemplation. 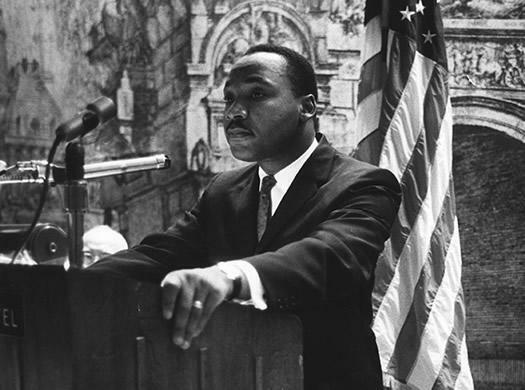 Special features of the housing complex included an amphitheater, fountains and statues, an outdoor basketball court with sideline seating, and a community center with full kitchen facilities. Cars were banished below the surface in two underground parking garages. In an alternate history way it's interesting to think about how the inclusion of more housing might have influenced the direction of that part of the city in the decades since -- and how it might be viewed today. 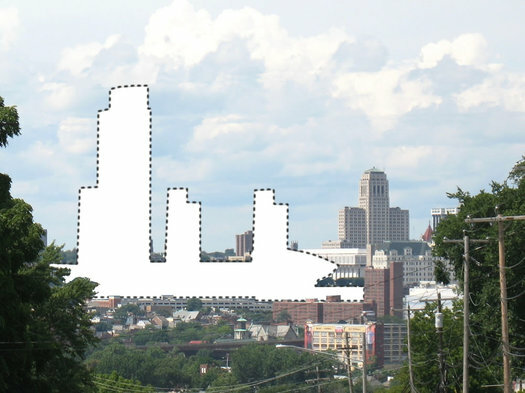 Would downtown Albany be more residential now? And as high-rise subsidized housing has fallen out of favor in recent decades, would there now be talk about changing Roosevelt Terrace? Head over to the OU site to use the photo slider. Check out these before-and-after aerial photos of Northeast cities posted by an academic institute at the University of Oklahoma. Albany is among the cities featured -- that's a screengrab above -- in the series of before/after sliding photos. 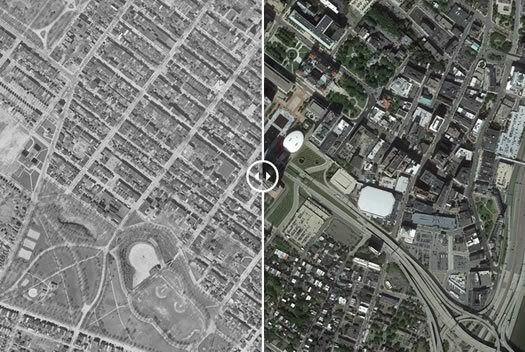 60 years has made a big difference in the urban form of American cities. The most rapid change occurred during the mid-century urban renewal period that cleared large tracts of urban land for new highways, parking, and public facilities or housing projects. Fine-grained networks of streets and buildings on small lots were replaced with superblocks and megastructures. While the period did make way for impressive new projects in many cities, many of the scars are still unhealed. We put together these sliders to show how cities have changed over half a century. One of the things that struck us as we moved the slider back and forth on the Albany photos was that, sure, the Empire State Plaza took up a lot of space -- but it's remarkable how the wide path was plowed for the South Mall Arterial connecting I-787 and the ESP. The institute's posted other series of sliding photos for Oklahoma and Texas, the Midwest, and Southeast. "One More Ride: The Hoffman's Playland Story" captures the history of the beloved family amusement park. For 62 years, it was where we brought our children to play and to celebrate birthdays. We rode the roller coaster and merry go round. It was a tradition of smiles and laughter for generations. 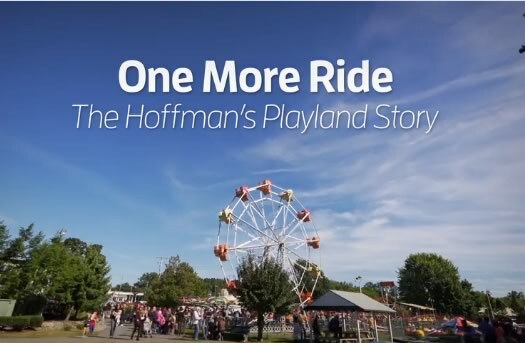 And while this past season was its final one, WMHT will provide viewers with one last ride as we celebrate the history, nostalgia and memories of Hoffman's Playland. We'll meet the Hoffman family whose long-standing devotion, work ethic and continuous attention to detail and perseverance made the park what it was. It will all come to life through original videography, archival photos, home movies, behind the scenes video and emotional on-screen interviews. 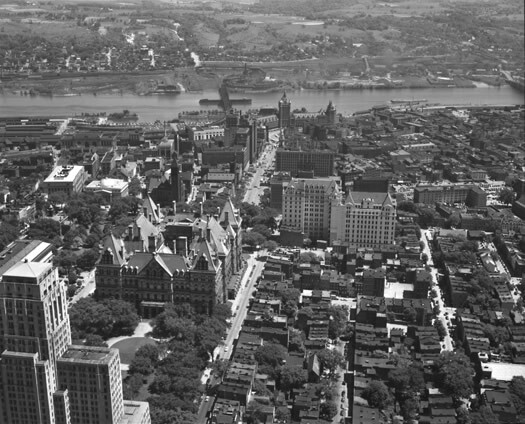 In 1962, one of the most massive urban renewal projects in American history sterilized the cultural and ethnic heart of Albany, New York. An arrangement made by first term Governor Nelson A. Rockefeller and longtime Albany Mayor, Erastus Corning the 2nd, displaced almost eight per cent of the City's diverse population, razed more than a thousand buildings, dislodged 3,600 households, and closed 350 businesses. The doc is set to air December 12 at 8 pm. OK, it probably wasn't a spaceship. Probably. One of the things we like about flipping through old architectural renderings is seeing the things that were proposed and, for whatever reason, never ended up being built. Because sometimes there's some out-there stuff. 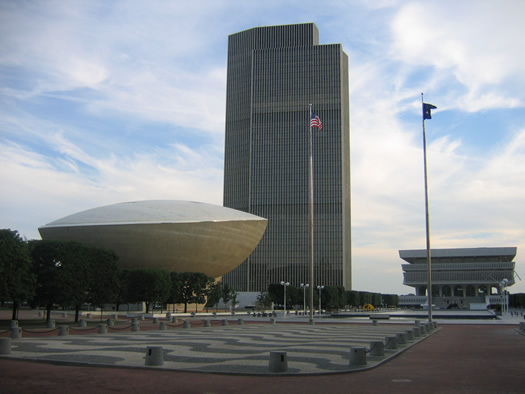 An example we came across today in UAlbany's online photos archive: Renderings of the Empire State Plaza that show some sort of arc spaceship-type-thing where the State Museum now stands. One of the images is above. 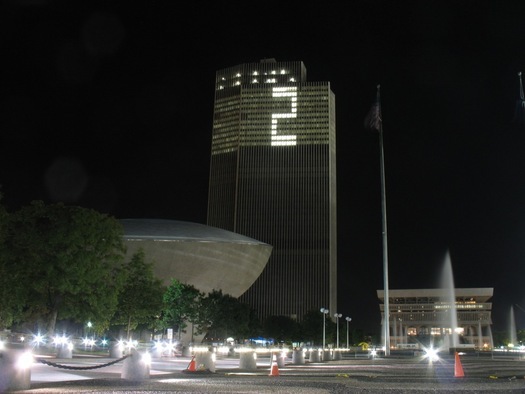 The Corning Tower saluted Derek Jeter Thursday night by lighting up his number on the building. The Yankee captain's last home game was also screened beneath The Egg -- and a few hundred people were there to watch. It turned out OK.
A few more large-format night photos from around the ESP and Capitol are after the jump. 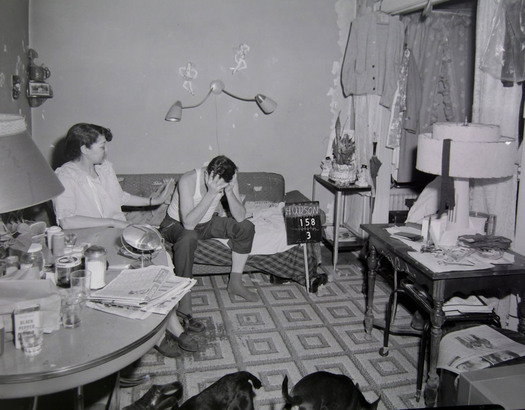 A scene captured by state Department of Public Works photographer in 158 Hudson during the time leading up to the demolition of the neighborhood for the construction of the Empire State Plaza. Pfau and Hochfelder say it was one of the first photos they turned up that prompted them to think the materials could lead way to telling more intimate, human-scale stories about the neighborhood replaced by the ESP. 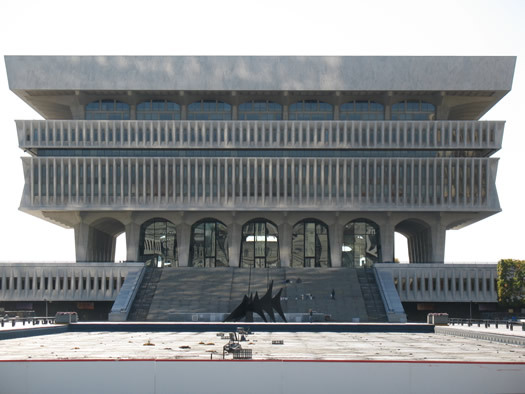 Almost everything about the Empire State Plaza is big: its physical size, its place in Albany's skyline, its presence in the city's history over the last century. It is architecture and history on a huge scale. But a new project is aiming to focus on the smaller, more intimate parts of the ESP's history. 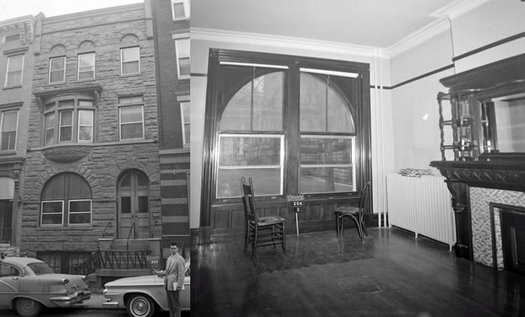 A group of historians, on Twitter as @98AcresinAlbany, is uniting two sets of photos -- a series of meticulous exterior shots in the Albany Institute collection, and a series of interior photos from a collection at the State Archives -- to recover a more detailed picture of that time. 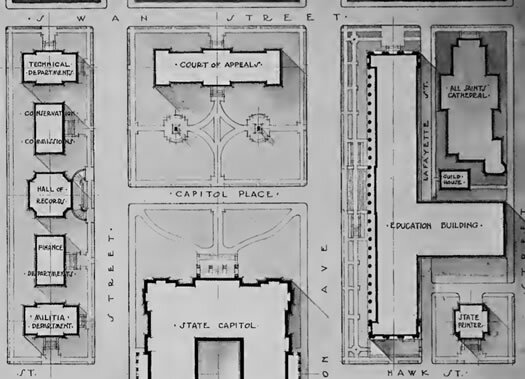 98 Acres in Albany is the creation of Ann Pfau (independent historian), David Hochfelder (professor at UAlbany), and Stacy Sewell (professor at St. Thomas Aquinas College). Their ultimate goal is to create a website to host these photos, document the history of the neighborhood, and collect memories and stories related to the ESP. 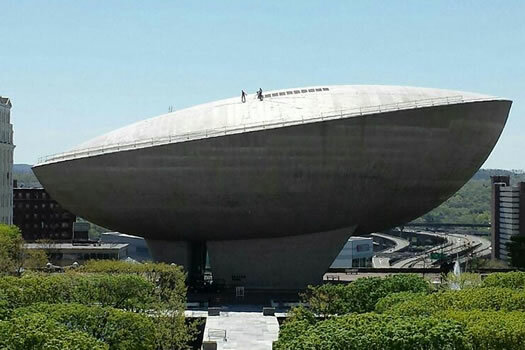 As Pfau recently told us: "We've found that everyone has a story about the Empire State Plaza, and everyone has an opinion about the Empire State Plaza." 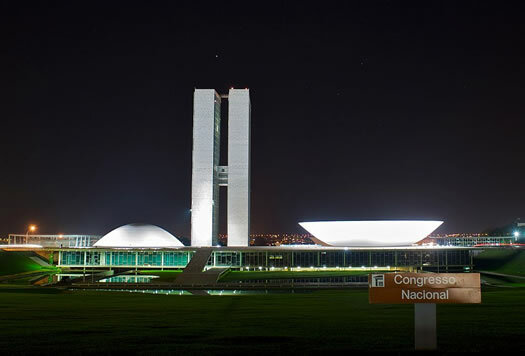 The National Congress Building in Brasilia. Look familiar? 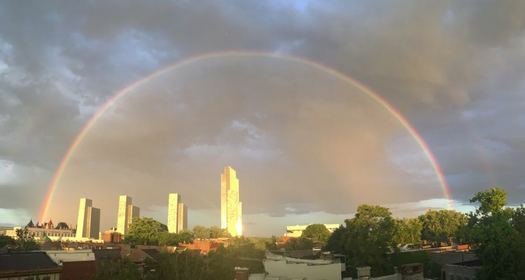 Without all the attention focused on Brazil right now for the World Cup, we thought it'd be interesting to highlight a reflection of the country in Albany. Check it out: "The Making of the Mall," a short documentary produced in the 1960s and 70s about the creation of the Empire State Plaza. The doc includes film of downtown Albany before the ESP, scenes of the area being razed, and shots of the buildings under construction. It really puts the scale of the ESP into context. The promise of the mall was magnificent. The reality discouraging. Ninety-eight acres of devastation, dust, and debris loomed more like the aftermath of war than urban renewal. Violent legal and political wrangling had been in evidence from the outset concerning the feasibility and value of this grandiose project. 6800 residents and 350 small businesses had been displaced with no housing planned for their relocation and, it seemed, no concern for their future. Though the years that went into making the mall were often painful, especially for longtime residents who had seen their homes, their schools, and their churches obliterated to satisfy the ego of one man, today they are proud of what they once called Rocky's Folly. But which has transformed a 300-year-old Dutch town into the most spectacular capital in the country. Not entirely sure what year it was from, but it appears to have been the work of Helen C. Welsh, a school librarian, library studies instructor, and serious amateur filmmaker whose other gems, such as the story of the Tulip Festival, we can only hope to uncover. The film is about 17 minutes long and well worth a look. We've pulled a few screengrabs to give you a sense of what it includes -- they're after the jump. The movies start at 8 pm. They're free. NYS OGS advertises on AOA. 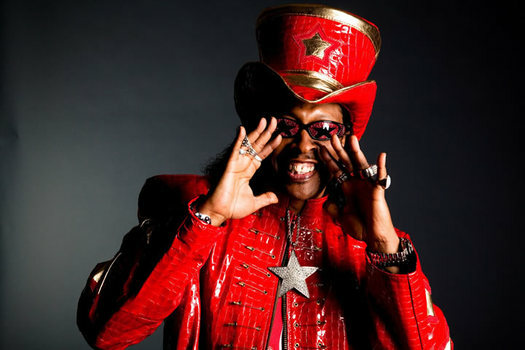 Bootsy Collins will be there in June. 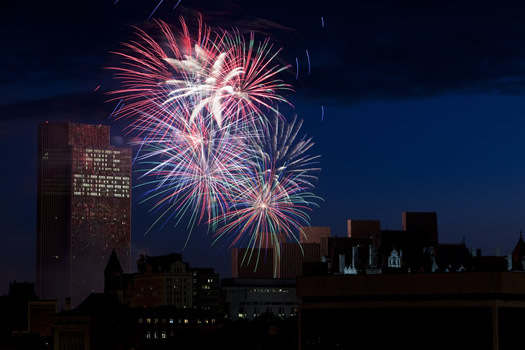 This summer's slate of events at the Empire State Plaza is out. 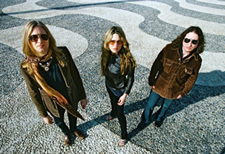 It includes the usual mix of festivals and concerts. The outdoor moves are also back this year, with some changes. The screenings -- now called "Friday Night Flicks" -- are being moved to West Capitol Park. And they'll happen each Friday night in August. The series will "feature classic films suitable for the entire family," according to the state Office of General Services. A larger version, for gawking. 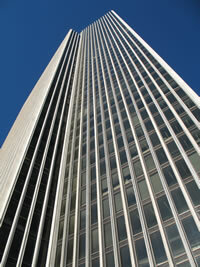 While at the ESP today we took the opportunity to head up to the Corning Tower observation deck for a few minutes. We always forget how fun it is to gawk at everything from up there. A handful of years ago check-in was required for the the observation area. But now it's just walk right in at the tower's base, head to the back of the bank of elevators (there's a sign), and take the quick (a bit wobbly) ride up. The downside: the observation deck is only open week days from 10 am to 3:45 pm. If you have the chance sometime, though, it's worth the quick side trip. 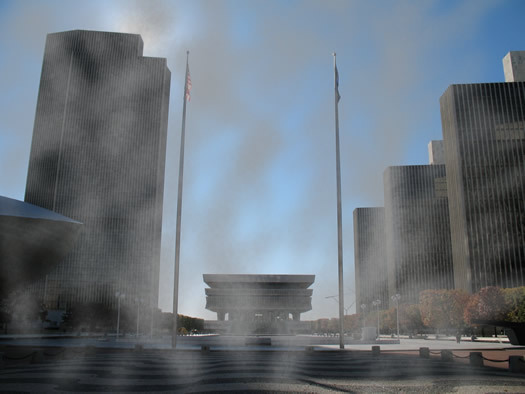 What if the Empire State Plaza was a bit... greener? Rob passed along this 1997 article about Albany from the Baltimore Sun today. 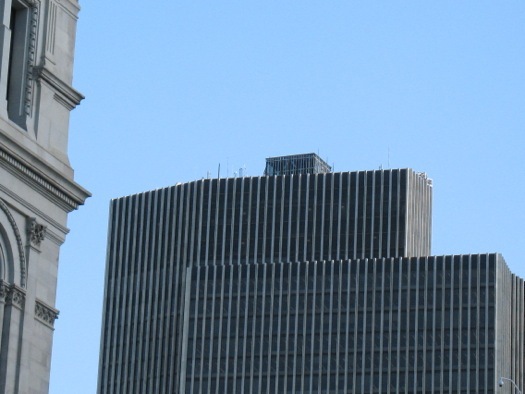 The headline: "Rockefeller's big dream realized Empire State Plaza: Locals who once scorned Albany's enormous government complex are grudgingly giving it some of the credit for the city's upscale renaissance." It's kind of interesting to read because as much as things change -- they don't really seem to change all that much. 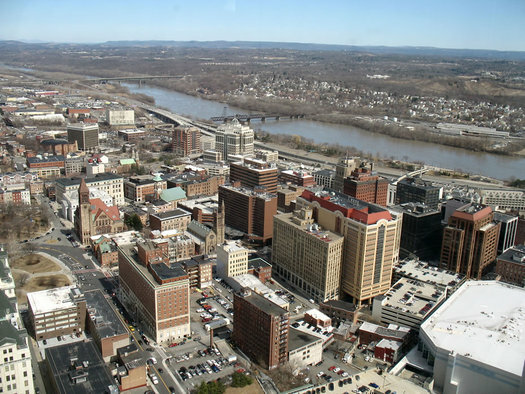 You'll recognize a lot of themes from any recent discussion about downtown Albany. 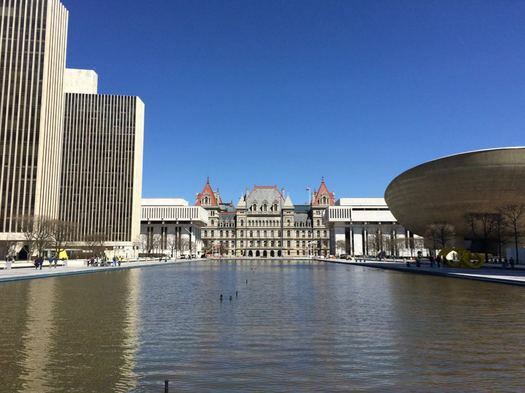 City officials complain that the plaza, while bringing tourists to downtown, has been less of a draw for residents of Albany and surrounding towns, such as Colonie, Troy and Rensselaer. The officials are proposing to replace one of the plaza's reflecting pools with a massive grass lawn, to encourage family picnics. "We'd like to humanize the plaza so people feel like they can approach," says Leveille. "We need to do the same thing with the river." The ESP with a giant, green lawn instead of one of the reflecting pools? What would that look like? The above (bad) photo illustration gives some sort of general sense. We're not sure what to think about that -- but it's an interesting thing to tumble for a minute or two. ESP ice rink opening postponed. Again. You know, winter really isn't making things easy for outdoor ice skating so far. (Shakes fist at the surprising not very cold winter sky.) 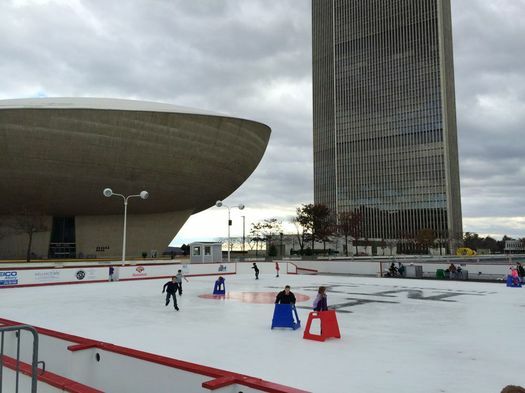 And as a result, the opening of the Empire State Plaza ice rink has been delayed again. The new kind-of-sort-of opening date: December 8, during the tree lighting event from 3-8 pm. Skating will be free (as always) and so will skate rental (as it is on Fridays). 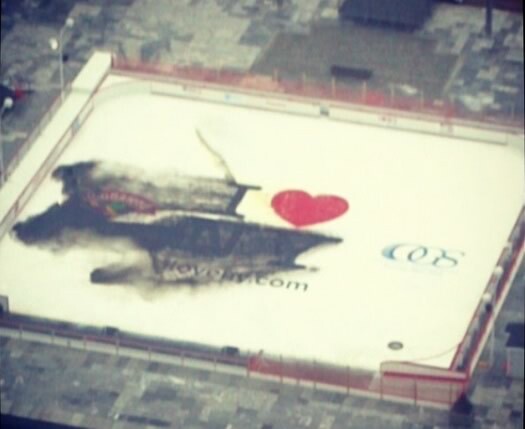 OGS says the rink will then close from December 9-12 "as crews continue to improve the condition of the ice." And then, weather permitting, the rink will open permanently for the season on Friday, December 13 (yeah, luck just isn't with this thing this year). This pic floated our way today via an unnamed state employee. Don't you just hate it when you're trying to print something and the ink ends up smearing? The ESP ice skating rink is scheduled to open for the season this Saturday at 11 am, weather permitting. Skating's free -- and so are rentals on opening day (along with every Friday). Ice skating on the plaza is one of those things that's worth doing at least once each winter. The fun:cost ratio is very high. 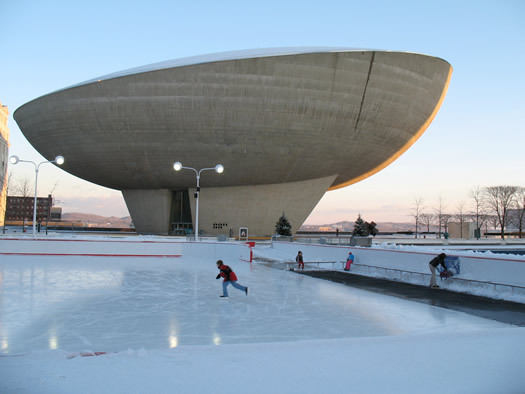 We've mentioned this a few times, but it bears repeating as its own post: The ice skating rink at the Empire State Plaza opens for the season this Friday, November 29. The rink -- located at the Capitol end of the ESP, near The Egg -- will be open 11 am-8 pm daily, weather permitting, until the end of the season (probably mid March). Skating is free. Skate rentals are $4 for adults / $3 kids 12 and under -- and every Friday is free rental day. The skating rink also hosts a handful of events during the season, including popular (and free) learn-to-skate clinics. The first one is this Saturday. Pre-registration is required and they fill up fast. Also this season: a few "rock and skate" sessions featuring live music. Tip: If you're worried about crowds, try stopping by after work during the weekday, if you can. Taking a few turns on the ice has a way of making it easier to release the stress from all those TPS reports. This winter will be the third season since the ice skating rink was restored followed budget cuts a few years back. It's one of those things that's worth doing at least once during the winter. The fun-to-cost ratio is very high. 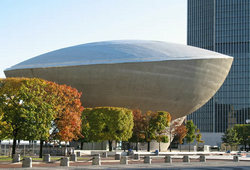 The state Office of General Services announced a new lineup of food options at the Empire State Plaza. The new options include an outlet for Pho Yum, the casual Vietnamese restaurant in Colonie, and Capital Q, the barbecue place in Albany's Pine Hills neighborhood. The new vendors start serving Monday, November 25. Also: "An announcement regarding the former Capitol Deli is forthcoming." A full list of the new -- as well as still present -- food options is post jump. Which arrives first? The electric cars, or the places to charge them? Gina recently contacted us looking to get some help with a situation, which breaks down like this: She and her husband are thinking about getting an electric car. He'd be using the car to commute -- he works at the Capitol. 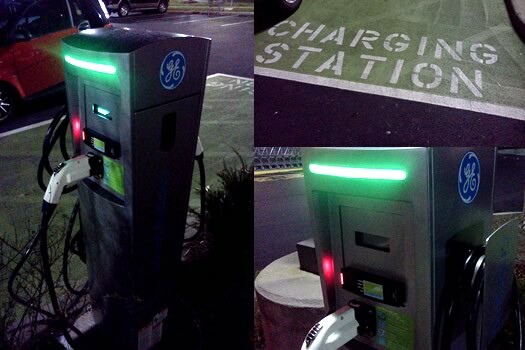 And though he's seen that the ESP has charging stations for electric vehicles, they're apparently not for general use. "For all the hype and press releases from the Governor's office about a new network of chargers statewide, the actual process for using them *on state worker territory* is frustratingly opaque." So we looked into the situation a bit. And we managed to get an answer. But more than anything, their situation highlights one of the challenges facing electric vehicles generally. 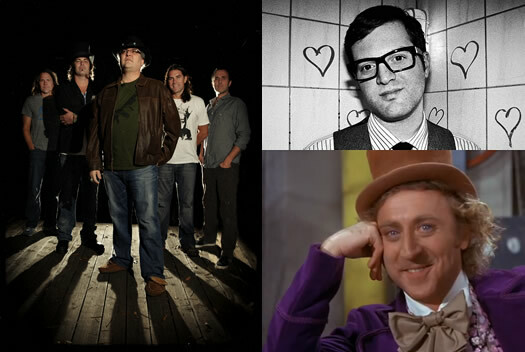 Among the lineup: Blues Traveler, Mayer Hawthorne, and outdoor screening of Willy Wonka & The Chocolate Factory. 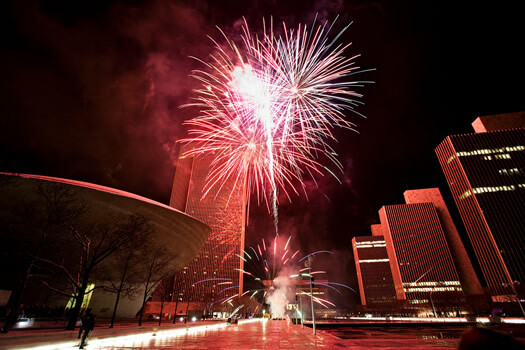 This summer's slate of events at the Empire State Plaza is out. It includes the usual mix of festivals and concerts. And the outdoor movies are back, which is good. A few people mentioned seeing workers -- and a railing -- on top of The Egg today. So... preparations for an Egg-top roof party? Or, finally, an effort to signal the mothership? The workers are up there re-coating the roof, part of normal maintenance that happens every 5-8 years, a state Office of General Services spokesperson told us. The railing is a temporary safety measure. The work is expected to be finished around September 1. The mothership will just have to wait. 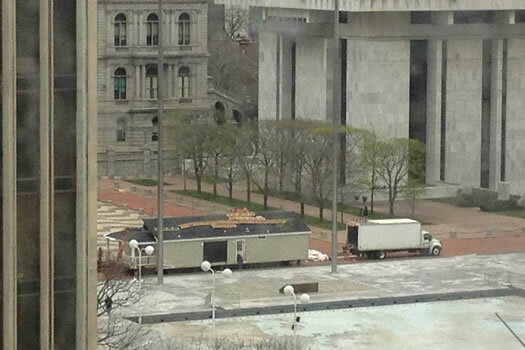 Anyone know why there's a trailer, excuse me, a modular home being built in the Empire State Plaza? In honor of the New York Housing Association 63rd Anniversary, the public is invited to visit a beautiful, two bedroom, two bath, thirteen hundred square foot manufactured home on display on the Empire State Plaza from April 27- May 1st. Bonus historical bit: Albany has a few of the first "manufactured" homes ever, uh, manufactured -- Jermain Street in Albany has five Lustron Houses, prefab enameled steel homes made in the late 1940s. Earlier on AOA: What are those holes by the ESP? This Temporary Parking Assistance Initiative will allocate these spaces based on state service to PEF and CSEA members who presently do not have spaces in state lots. OGS initiated this one-time, single purpose allocation for downtown state parking after consultation with PEF and CSEA to provide timely relief to state employees who may be impacted by the City of Albany's Residential Parking Permit System. Update: OGS spokesperson Heather Groll tells us the spaces are in most of the downtown state operated lots. The agency has posted a form for members of CSEA and PEF who'd like to apply for spots (they'll be assigned by state seniority). The deadline is February 13. Last September irisira posted a very good comment about the state of downtown state employee parking. It's been about two weeks since the Albany residential parking permit system started. We're curious about how things have shaken out so far state employees around the ESP. Longer walks? More bus riding? Complete mayhem? Taking a few turns last year on the ESP. 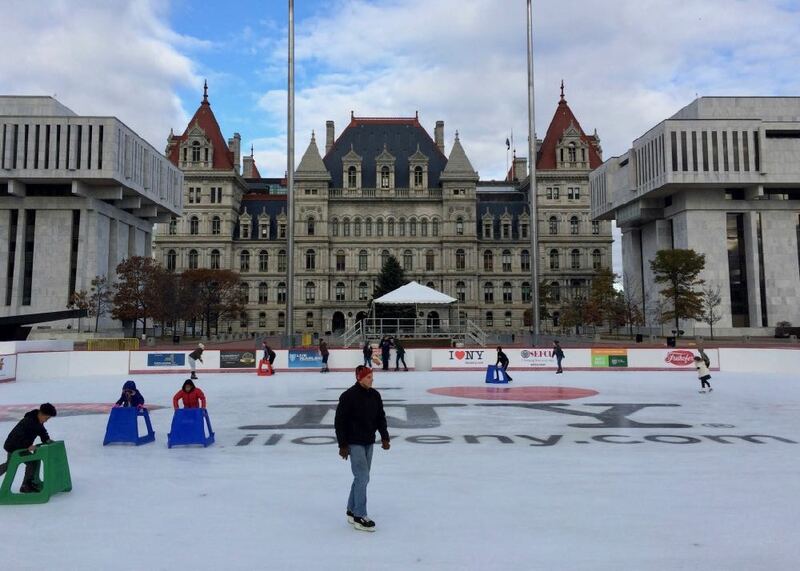 The ice skating rink at the Empire State Plaza will open this Friday (November 23), the state Office of General Services announced today. The rink will be open seven days a week from 11 am-8 pm. It's free to skate. Skate rentals are $3 for kids under 12 / $4 for adults. Each Friday this season will include free skate rentals, thanks to sponsorship by Hannaford. 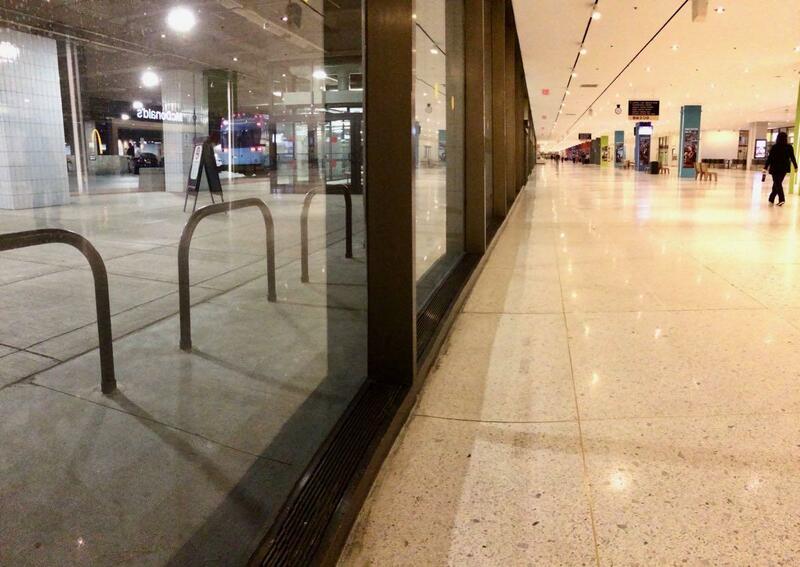 OGS says the lockers and skate rental are now on the plaza level next to the rink. It's great to see the rink returning for another year. Public spaces are better with people. And it's fun! We went skating a few times after work last winter -- it helps you let go of the hassles from the day. The state Inspector General's Office announced today that a state Department of Health employee has been arrested for allegedly scoring a handicapped parking pass for the Empire State Plaza by using a forged doctor's note. The Inspector General's investigation determined that in May of 2011, Witt obtained special parking privileges at his work location at Empire State Plaza based on a forged doctor's note. In addition, Defendant admitted that on three separate occasions in January and February of 2012, he submitted certified time records indicating that he had worked full days when he had not reported to work at all. "New Yorkers have every right to expect that state employees will comport themselves with the highest degree of honesty and integrity," said Acting Inspector General [Catherine Leahy] Scott. "Fraudulently obtaining handicapped parking not only is unlawful, but potentially inhibits the rights of New Yorkers with disabilities in need of accessible parking. Further, any fraudulent abuse of time and attendance records undermines public trust. Such conduct is not tolerable." The IG's office says Witt has been charged with four felony counts -- and faces up to four years in prison if convicted. By the way: Does anyone know how long the waiting list is now for a parking spot at the ESP? 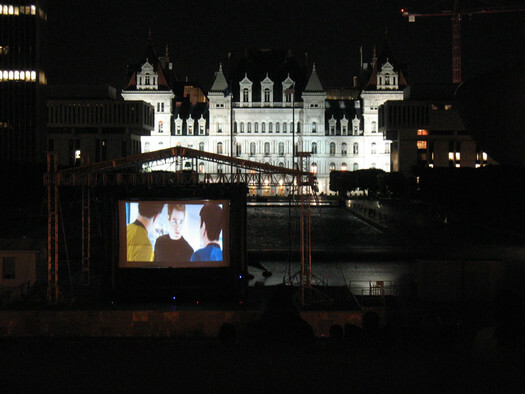 We checked out the screening of Star Trek at the Empire State Plaza Wednesday night. The weather was absolutely beautiful. And it was a fun time. This was the second of two outdoor screenings this summer at the ESP. We'd love to see them do it again next year -- especially if they work out some of the technical issues, and maybe get a bigger screen. Like with the skating rink in the winter, it's great to see people enjoying the public space during non-work hours. Also: Albany apparently loves Leonard Nimoy. Though, really, who doesn't? Mike Doughty will be there. 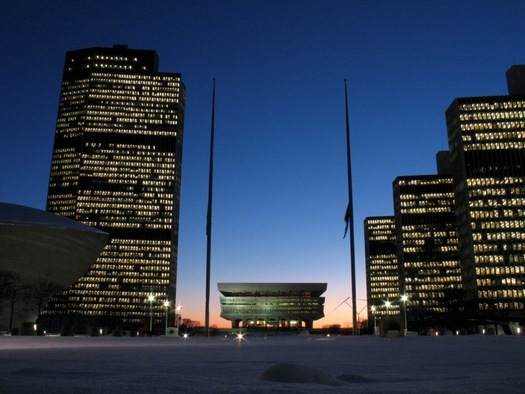 The schedule is out for this year's At The Plaza series of events at the Empire State Plaza. There are fireworks on the Fourth of July, of course, and some of the festivals return. But new this year: outdoor screenings of two movies: Puss in Boots on July 25, and Star Trek (the recent, JJ Abrams one) on August 8. 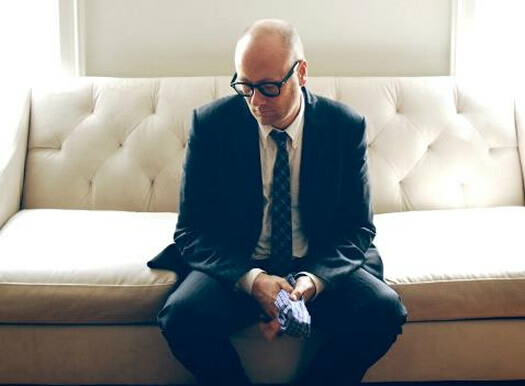 Also: Mike Doughty is headlining the "Local Legends Live!" concert on September 8. All the events are free. Full schedule is after the jump. Drive on the Empire State Plaza? The future then. A cropped version. Here's the full version. 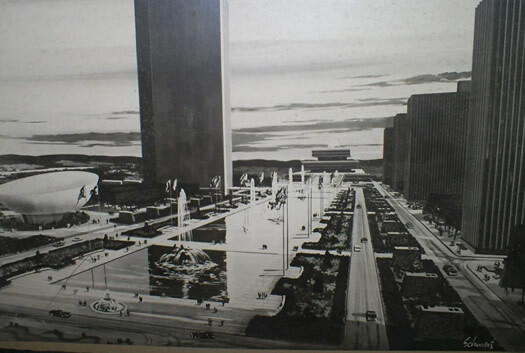 Today on Craigslist we stumbled across a listing for these great old renderings envisioning an auto-centric version of the Empire State Plaza. Here are easy-to-view versions: one, two, three, four, five, six. There isn't a date listed for the renderings -- the Craigslist poster says he/she is looking for info about them (and accepting offers). We're guessing they're from the early to mid 50s (construction started in 1959). Check out how there are streets right on the plaza, running next to the agency buildings. 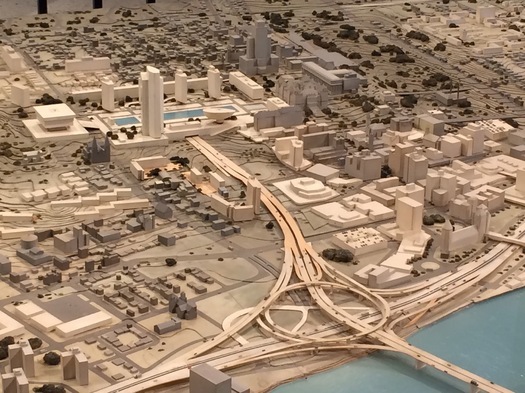 And this overview rendering gives a sense of the imagined context. photo: Craigslist item "Paintings of Empire State Plaza"
There's a professional boxing at the Empire State Plaza Convention Center this Saturday night -- which struck us as kind of unusual because... it's the Empire State Plaza Convention Center. The only people who usually trade jabs there are politicians and lobbyists. 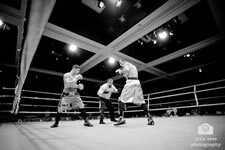 The card for Saturday night's events at the ESP includes 8 bouts. The first bout is at 6 pm. Tickets start at $40. By the way: If there's going to be boxing at the ESP, it would seem kind of hard for politicians to keep pushing the state ban against MMA. The annual Corning Tower stair climb for the Cystic Fibrosis Foundation of Northeastern NY is March 8. The climb includes a few subdivision: individuals, a relay race (four person teams), a 13-floor climb for individuals, and most impressive -- a firefighter's climb (yep, firefighters going up all those steps while wearing their gear). Hey, it's only 42-floors (809 steps). Easy, right? Heh. Liz -- who we're sure has a level of fitness and athleticism to which we could only hope for -- did the stair climb last year. She felt the burn. Registration is now $40 (there's also a $125 pledge minimum). Check in begins at 4 pm, and the climbing starts at 6 pm. The ice skating rink at the ESP re-opened this past Saturday for the first time since 2008. So, of course, we had to take a few turns. Update Jan 3, 2012: Here are details about skating at the ESP rink. Update Dec 14, 2011: OGS says it's aiming to open the rink the first week of January -- and skates will be available for renting (it will be free to skate). The rink's comeback is being funded in part by a $100,000 contribution Lake Placid Regional Winter Sports Committee, which is a "non-profit focused on supporting and developing Upstate New York as a sport destination for international and national winter sport events." In the grand scheme of things, the skating rink isn't a big thing. But the news a few years back that it wasn't coming back because of budget cuts was a bit of a "gulp" moment about the economy and state budget. And there's just something beautiful about the scene created by people skating on the ESP. It's great the rink will be back. If you've never seen the ESP rink -- or just want to remember what it looks like -- a few more photos from early 2008 are after the jump. An overview map of the proposed coverage area. Much bigger versions are the after the jump. The public hearing for the proposed Albany residential parking permit system is tonight (Monday) at 7 pm at city hall. The public hearing is one of the last steps before the system could potentially be passed and moved toward implementation. Resolving the street designations is the major issue that needs to be resolved; once that is completed the remaining pieces should fall into place. 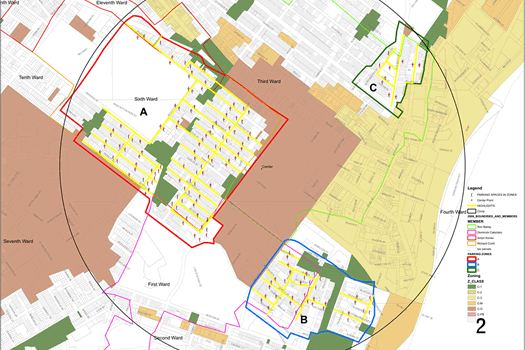 Details and maps of these proposed zones are available from the city's website -- and we've also posted them after the jump here for easy scanning. The state law giving the city the right set up the system allows for 2,750 spaces within a 3/4 mile radius of the ESP. Once implemented, the system will run for two years and then be up for review. Car sharing: We hear that car sharing advocates will also be at the hearing tonight pushing their case. In the past, advocates have touted sharing as another way of addressing the parking problem in congested neighborhoods. 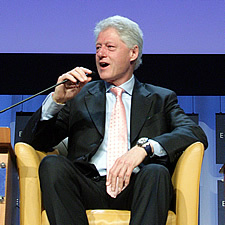 After the announcement of the $4.4 billion big thing about small things, Bill Clinton spoke at the New York Open for Business conference Tuesday at the ESP. The video is embedded above. Clinton's speech starts at the 50:00 mark (you can just jump to that point). At the beginning of the speech, Clinton gives a shoutout to Jerry Jennings and remembers... jogging in Albany. The state Department of Transportation announced Wednesday night that it was immediately closing the South Mall Expressway -- that's Routes 9 and 20 between the Empire State Plaza and the Dunn Memorial Bridge -- because an inspection found cracks in beams that support the road. The full release -- with suggested alternate routes -- is after the jump. 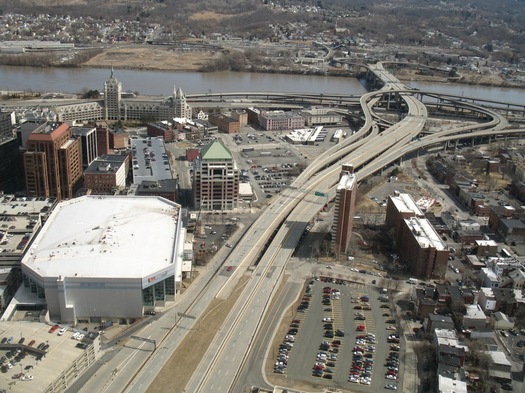 Also part of the closure: the Madison Avenue off-ramp from I-787 south, the South Pearl Street on-ramp leading to the Dunn Memorial Bridge, and the part of Broadway between the Quay Street Connector and Madison Avenue. The Dunn is still open, but down to one westbound lane (that is, heading toward Albany). Albany police say they expect backups Thursday morning, maybe as far back as Rensselaer. They're suggesting people use alternate routes if possible. A totally unofficial estimate of the area to be covered by the parking permit system. The task force developing the Albany residential parking permit system released its report and recommendations last week. The file that we received from Common Councilman Richard Conti, the task force's chair, is embedded after the jump. The report includes many of the provisions Conti mentioned when we talked with him about the system in June. But there are few bits that caught our eye -- we've highlighted those. What's up with the Albany parking permit system? 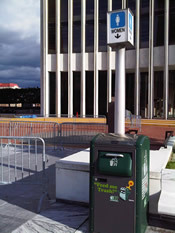 It's been just about a year since the state legislature passed a bill allowing the city of Albany to set up a residential parking permit system near the Empire State Plaza. So, where's all that at now? 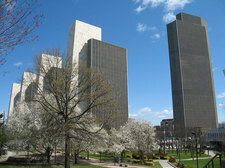 Like lots of Albanians, I have a love/hate relationship with the Empire State Plaza. I've never known Albany without the ESP. It's just always been there for me. I know I'm coming home when I see it on the horizon. It's a symbol of this city, and there's no changing that. Nelson Rockefeller sure knew how to make his mark. 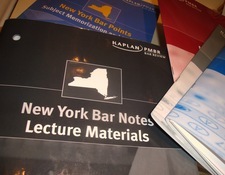 If you see a lot of stressed-out lawyer types around downtown Albany this week, carrying their personal belongings in clear zip-lock bags, there's a reason for that: The New York state bar exam is being administered today and tomorrow at the Empire State Plaza. People come to Albany from all over the country and the world to take the New York bar. The state's exam has a reputation as one of the toughest -- if not the toughest -- in the country. As a test-taker said in the ABA Journal a few years ago, "If you've passed the New York bar exam, you can probably pass any other state bar." One lawyer noted that California's exam is longer, "but in substance, it was easier than New York." More than 4,000 people took the test last February at sites across the state. First-time takers from ABA-approved schools passed the state bar exam at a rate of 80.5 percent. But the rate for all candidates -- domestic and foreign educated, first-time and repeat takers -- was 50 percent. Here's something that might be worth checking out on Wednesday: the annual At the Plaza Food Festival will be set up on the ESP from 11 am - 9 pm. 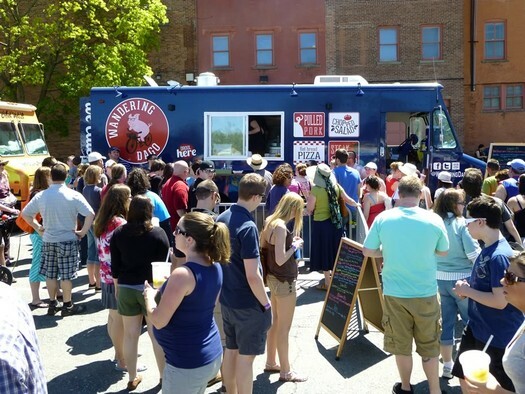 The event blurb says there will be 50 food vendors, which might make for a fun lunch stop. A sample of the vendors is after the jump. And there's music, too. Among the lineup: locals Super 400 will be playing at 6:15 (that's them on the right, at the ESP even). And the Smithereens (yep, those Smithereens) will be playing at 7:45. Is there a world record in the can? The event blurb says Sasseville is looking for people to "help him shatter this world record with a noise so loud it can be heard in Canada!" (Payback for the earthquake?) The publicist for the event says they need 500 people to break the record. The approximate area covered by the 3/4 mile radius. 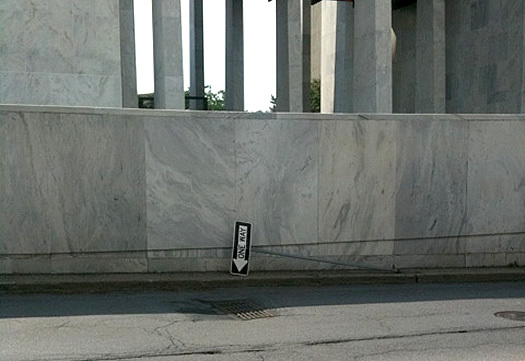 Not every spot will be subject to the permits. Albany Permit Parking Bill just passed the Assembly, 80-45! Thanks to Assemblymembers McEneny and Canestrari for their efforts on moving this forward ... now it moves to Governor Paterson for approval. The bill passed in the state Senate last week. + The City of Albany would be allowed to "pilot a residential parking permit system with a two year sunset" within a 3/4 mile radius of the ESP. + Permit parking would not be allowed on streets where adjacent properties are zoned for "commercial, office and/or retail use." + At least 20 percent of the spaces in the permit would be available for non-residents to use for at least 90 minutes at a time. The New York State Public Employees Federation (PEF) is disappointed state lawmakers have passed the Albany Permit Parking Plan, pandering to a small group of residents while shunning the needs of the general public. The union is calling for Paterson to veto the legislation. Earlier on AOA: Is the brake coming off residential parking permits near the ESP in Albany? "An authentically quaint vision of a hopeful future"
It looks dated now because we currently like to affect older historical styles. Give ESP another 40 years and it will no longer be old, but venerable and -- perhaps -- an authentically quaint vision of a hopeful future. Is the brake coming off residential parking permits near the ESP in Albany? 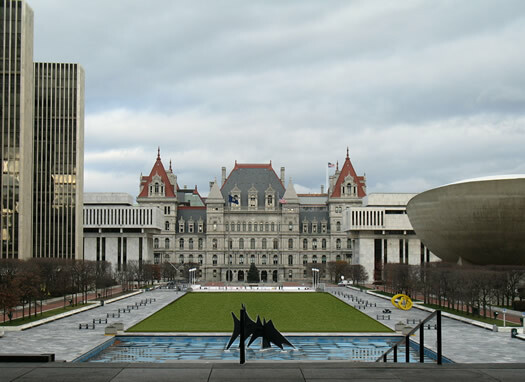 Via Bob Conner comes word that a bill allowing residential parking permits near the Empire State Plaza is moving through the legislature again. The bill passed in the Assembly a year ago, but died in the state Senate. Bob reports that Neil Breslin says it looks like there will be enough votes to pass it this time around in the Senate. + No more than 2,750 spaces would be allowed in the permitted area. + Permit parking would not be allowed on streets where adjacent properties are zoned "commercial, office [and]/or retail use." One possible hitch: the Assembly version of the bill differs from the Senate version in the size of the allowed area for permits -- 3/4 mile vs. 1 mile. Bob reports that CSEA dropped its opposition to the bill because of the reduced radius. Update: Albany common councilman Richard Conti stopped by in the comments to note the Senate bill is identical to the Assembly bill and includes the 3/4 mile radius (it appears the Open Senate entry for the bill hasn't been completely updated, yet). Jerry Jennings told AOA last October that he wants permit parking -- and would pursue it if the legislature allowed it. 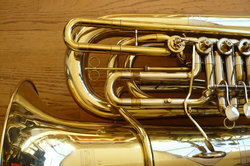 Tuba Christmas is a flash mob style concert where by low brass (tubas, French horns, etc.) show up someplace, practice a bunch of Christmas tunes, and then play 'em. I've attended a bunch of these (in Baltimore, out on the Eastern part of MA) and it's awesome, but they depend on getting the word out. http://twitpic.com/kohmv - albany egg: post soundcheck, people showed up to cover up some of the red. The Egg has popped on another "weird building" list -- it's #4 on Popular Mechanics' list of "The World's 18 Strangest Buildings--And Why We Love Them." The mag geeks out on The Egg's "intensive support system." Last year the theater showed up on a list of 50 strange buildings. One more list and we think The Egg gets inducted into the hall of fame. 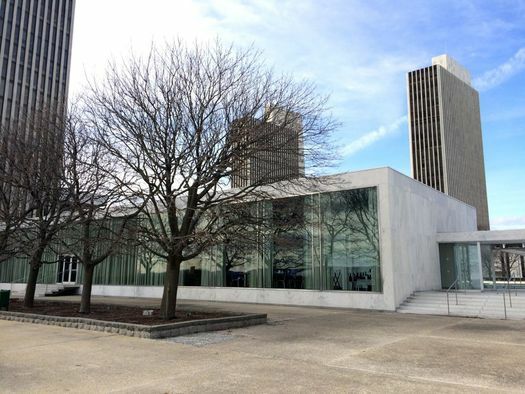 A state janitor was arrested and his boss suspended this week amid allegations that they created a hidden party lounge at an Empire State Plaza garage to sell drugs, smoke pot and sleep for hours during work shifts. This hidden lounge allegedly contained "couches, TV and scales to weigh marijuana." The press release actually uses the term "man cave." The janitor is also accused of using his Office of General Services truck to make pot deliveries to other state workers during his shifts. Both he and his supervisor have been suspended without pay. 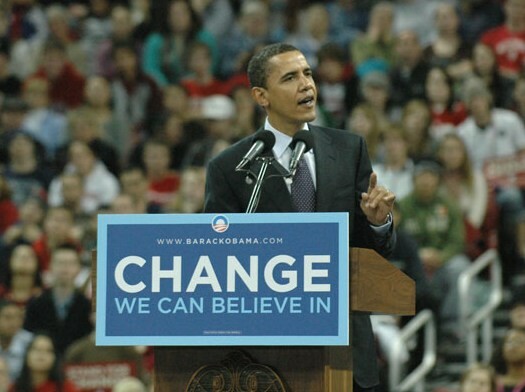 We're guessing he's going to give a good speech. Madonna (no, not that one) emailed us this week asking if we knew about any places hosting parties or events related to the inauguration. So far, we haven't come across anything that really stood out. Anyone hear of something good? Please share. If you work around downtown Albany and are looking for a place to watch with some other people, we heard today that the NY Network will be showing the inauguration on the big screens at the Madison Ave end of the ESP concourse. Yellow Blue is back... or is it? Kelly is said to have thought the ESP needed some color. The Ellsworth Kelly sculpture Yellow Blue is back in its place at the foot of Building 3 at the ESP. It had been on a sort of spa vacation for the last couple of months. And it's returned looking very refreshed. Matha Wainwright. Presumably she'll be right-side up tonight at the ESP. 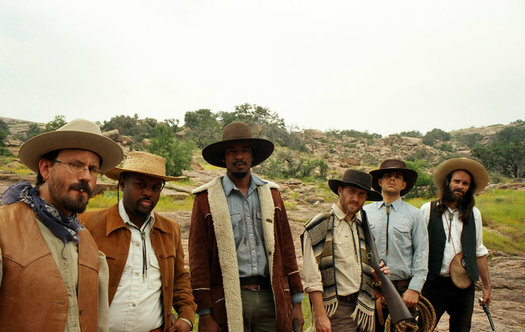 The At The Plaza concert series has a show lined up tonight that should be pretty popular. KT Tunstall is headlining. You probably know her from "Black Horse and the Cherry Tree" and "Suddenly I See", which has been played in pretty much every TV show and movie trailer over the last year or so. Also on the bill is Martha Wainwright, daughter of Loudon and Kate McGarrigle and sister of Rufus. 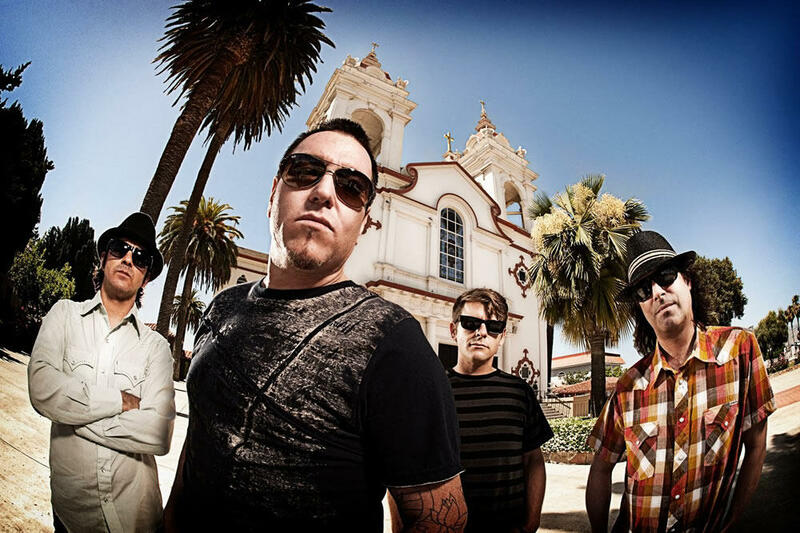 Things get started at 5 pm with locals The Audiostars. Wainwright's scheduled for 6 pm, followed by Leon Russell at 7 pm, and then Tunstall at 8:45. It's free. Ever wish you could just rise above it all? 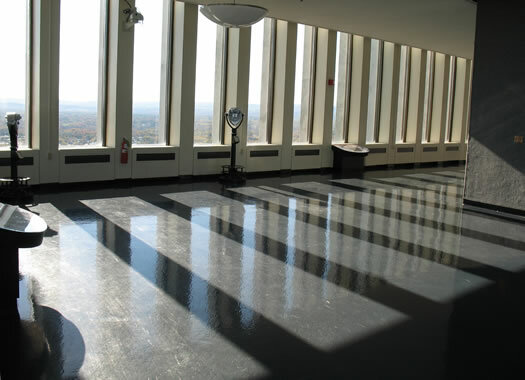 Try looking down on your friends and neighbors from the observation deck of The Corning Tower. (It's the reallllly tall building at the end of the capital mall.) You can see the Adirondacks, The Catskills, The Berkshires, The Empire Plaza, even The Governor's Mansion (Is that a tiny steamroller?). If you live downtown you can walk. Otherwise, park under the plaza. Just bring your photo id. Getting into the tower isn't hard, but you have to jump through a few post 9-11 security hoops. If you enter from the plaza level, you'll have to take the escalator down, present your id and get your picture taken. The guard will print an unflattering photo of you on a name badge.Stick it on and head back up to the plaza level to wait for the express elevator to the 42nd floor. It's really not as much trouble as it sounds, and on a clear day, it's well worth the view. There are signs below the windows with tips on what there is to see, and a representative from the NYS tourism department is on hand to answer questions. Fun, informative and oh yeah, free.